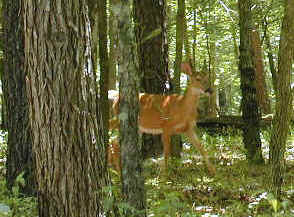 The referee comes up to the mic in front of the video camera in the clearing of a forest. A small audience gathered around the clearing claps and whistles. "Ladies and gentlemen! Welcome to Great Outdoor Sports! Thank you for joining us today on this lovely afternoon. Now let's meet our players. Our first player comes from Allsburg. Please meet John Rethun!" John comes toward the referee, waving and smiling. The audience roars with applause and a few random shouts. John shakes hands with the referee. "John," the referee says. "It's good to have you here." "Good to be here," John replies. The referee turns back to the camera. "Our second player comes from this very forest. Please meet a deer!" The deer slowly comes up to the referee, looking around, obviously in a state of confusion. The audience applauds and whistles. "What's going on? Who are these people?" "Deer, its good to have you here today," the referee says, giving the deer a pat on the shoulder. "Good to have me where?" the deer says, looking around. "Ok, lets get down to the game," the referee says. "You both know the rules. Or one of you does, that is." "Game? What game?" the deer asks in his perplexity. The referee explains. "John here is going to chase you. He is going to try to kill you." "Kill me? What the..what kind of game is this?" "If you outrun him, you can live, unless he finds you," the referee continues. "If, or rather, when he kills you, he wins your body to do with as he wants. He might want to hang your head on his wall, eat your flesh, wear your hide, whatever." "Yes," John says. "I have a beautiful spot above my fireplace for your head. And I have always wanted to make my own deer skin wallet, so I will be using your hide for that." The deer steps back in horror. "You people are sick! I can't believe this!" The referee replies. "This isn't sick. This is a sport. It's completely acceptable, right folks?" The audience wildly applauds and shouts. "I have studied deer for 5 years," John tells the referee. "I know all about their mating habits, I can mimic their calls, and I know where and when to find them. I have come to respect deer very much." "Respect?! You respect me so you want to kill me? What kind of logic is that?!" "If the deer lives," the referee says, "he wins his life, at least for today. If John wins, he wins the deer." "John, here is your weapon." The referee hands John a rifle. "He gets a gun?!" the deer cries out. "That's not fair! What kind of sport is this!?" "Now on my signal, deer, you start running," the referee says. "No! I don't want to play this stupid sport! I didn't ask to!" "You don't have a choice, my friend," the referee says. "Now...go! "The deer bursts off in a sprint for his life. His heart is racing as he dodges trees and brush. "This isn't happening to me! I can't believe this!" After several minutes of running, the deer tires out, slowing to a mild trot. Finally he stands still, his chest heaving with heavy breathing. He holds his breath to listen for sounds of chase. An eerie silence fills his ears. The deer laughs shakily to himself. "Hey, maybe I outran--AAHH!!" A piercing pain runs through his heart. He falls to the forest floor. He feels his own blood pour from his side, trickling down his thigh. He gasps for air, each breath searing with pain. The referee, still at the clearing, pulls John's arm up. "The winner!" John smiles and waves the still smoking rifle in the air triumphantly. The audience roars in cheers and applause. Some start chanting John's name. The deer, in excruciating pain, speaks with his final breath before succumbing to death.